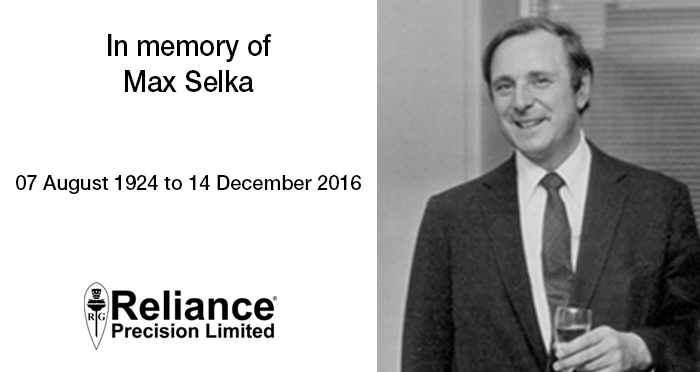 Reliance is sad to announce that its founder, Mr Max Selka, passed away last week at the age of 92. An integral part of the business throughout his life, he will be greatly missed. When he purchased the business back in 1955 Mr Selka already had a vision of the company he wanted to run. He changed the focus of Reliance to manufacture engineered gears, and he and his wife Jenny have worked tirelessly ever since to turn Reliance into the world class organisation it is today. Mr Selka always remained true to the vision he had 61 years ago, ensuring that at the heart of the business remained the core values important to him – quality, the welfare of his employees and the provision of interesting, challenging work.